Step 3 = Atheist tells you to read some article/book that will show why your arguments are wrong, rather than offering any rebuttal of his own. It’s the “I know someone who can beat up your dad” response. Step 4 = Theist takes the time to read the article and interact with its claims. Responds to atheist with reasons why the article’s claims are mistaken. Step 5 = Atheist ignores everything you said in favor of nitpicking at some irrelevant point. Asks for more evidence. Step 7 = Atheist acts like you skipped step 6, dismisses everything you say with a hand-wave rather than a rebuttal, and resorts to name calling and putdowns. Step 8 = Theist calls atheist on the carpet for what he’s doing. Atheist doesn’t respond. Step 9 = Atheist goes looking for easier targets – those who will cower at the mention of his intellectual superiority, have nothing to offer in the way of rebuttal, and do not even think to demand that the atheist offer any evidence for his claims. Awfrick, if you are reading this, I invite you back to truly engage on the topic you started. All other atheists, if this is not descriptive of you, I am not claiming it is. I appreciate the atheists who have engaged me on this blog in a serious dialogue. I cannot appreciate those who assert the greatness of their intellectual superiority and strength of evidence, but never deliver on it. If you’ve got the goods, show me the money. If not, play at a different table. This blog is for the serious–for those who want to engage in dialogue on serious matters in a serious, sensible way. 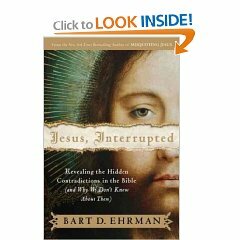 I just finished reading a tremendous review of Bart Ehrman’s latest book, Jesus Interrupted, by Michael Kruger. I would highly recommend it. The last paragraph is literary gold in my book. It’s one of those summary paragraphs that I would have loved to have penned myself. Would it be Moral to Marry a Conjoined Twin? Scott posed an interesting question to me that both of us thought would be a good blog topic: Would it be moral for a man to marry a conjoined twin, or would such constitute polygamy, or even adultery? Let’s call the conjoined girls Mary and Martha. You wish to marry Martha, but not Mary. Martha accepts your proposal, and Mary has consented to the relationship you’ll have with her sister (she even promises to be at your wedding J ). Would it be immoral to marry Martha under such circumstances. Why or why not? The answer to this question is more telling than the simple affirmation that one thinks abortion should be legal even though they are personally opposed to it, because this question helps reveal why someone holds the position they do. If someone says they would vote in opposition to such a proposition, it reveals that their real concern is not so much that they believe a woman should have the right to abort her unborn child, but rather that they should be able to keep the right once it has been granted to them. Many people are uncomfortable taking away rights that have already been granted, but would vote against granting such rights in the first place. If someone says they would vote in favor of such a law, it reveals that they either have a very idealistic view of liberty (that people’s liberty should be nearly autonomous, even when their liberty involves taking the life of an innocent and defenseless human being), they are relativistic when it comes to moral judgments, or they aren’t truly persuaded of the pro-life position and pro-life logic. A young skeptic once called into Greg Koukl’s radio show, Stand to Reason, and asked why we should believe our senses are reliable. Why shouldn’t we believe we are in some computer program like the Matrix, which has fooled us into believing we are experiencing reality when in fact we are not? Greg’s answer was ingenious: because we’re alive! Survival in the real world depends on our ability to accurately perceive the real world and maneuver safely within it. If our perception was off even a little, the effects would be disastrous. That’s why people who drive cars while intoxicated often end up in fatal accidents: their ability to accurately perceive the outside world is impaired. The fact that we are still alive demonstrates that our senses allow us to perceive reality in a fairly accurate manner. But couldn’t it be the case that the outside world we think our senses are accurately perceiving isn’t really the outside world at all (like the Matrix)? Yes it’s possible, but why should I believe that to be the case? Just because it’s possible that we could be mistaken in what we perceive about reality does not mean we are mistaken, or should think we might be mistaken. Possibility and probability are not the same things. We are prima facie justified in trusting our senses that what we perceive to be the real world is the real world, until evidence arises to the contrary that would falsify this properly basic belief. See J.P. Moreland’s short article entitled “Answering the Skeptic” for further reading. I am reading Antony Flew’s book, There is a God. In an appendix written by Roy Varghese, he relates what appears to be an apocryphal, but nevertheless insightful exchange between a skeptical student and his wise professor. The student asks his teacher, “How can I be sure I even exist,” to which his teacher responded, “Who’s asking?” Classic! Aphorisms are everywhere, including Christian circles. People love aphorisms because they are short and convey truths in a witty, memorable fashion. The problem with aphorisms is that while they are intended to convey general truths, many people take them to be Gospel truth. “All we need is God” is a popular Christian aphorism. There is a lot of truth to this. We need God more than anything else, and to the extent that this aphorism emphasizes that fact, it should be affirmed as true. But if “all” is understood literally, so that it comes to mean that we have no need of anything other than God, then the aphorism is patently false. Indeed, it is unchristian. While we need God most of all, Scripture is quite clear that we also need people—particularly people of like precious faith. God created humans as social beings, to be in community with other human beings. That is why one of the greatest forms of punishment/torture is isolation. It’s said that people who experience long periods of isolation literally begin to lose their mind. We need people. The need for community is not some defect in humanity resulting from the fall, either. In the beginning, prior to the first act of sin, Adam desired a human companion. When God presented Eve to him he exclaimed, “At last!” (Genesis 2:23) Even God Himself concluded that it was not good for man to be alone (Genesis 2:18).